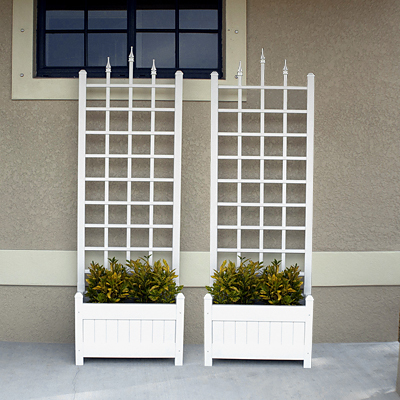 Create a magnificent entry to your home or yard by placing these Dura-Trel White Camelot Planter Trellises in it. This set of two sturdy planter/trellis combinations brings vertical style to your patio or yard in moments, as well as a place to showcase your favorite climbing plants. The rectangular planters rest on a level surface easily, and the paneled look adds a traditional hint to them. The included Dura-Trel White Camelot Trellises affix to the back of each planter, for fantastic height on each piece. Finials top each of the vertical supports on the trellises, enhancing the sovereign theme, while the rectangular lattice offers tendrils plenty of places to grip. The high quality, vinyl construction of each piece contains the greatest concentration of Titanium Dioxide available, which acts as a protectant and stabilizer against ultraviolet light. This ensures the structures will not fade, rot, or warp, for use outdoors for many seasons. Each piece will also retain its crisp, white color, contrasting your plants for a lovely garden hint. Enhance your yard or entry with planting area and vertical style using these White Camelot Planter Trellises. Assembly required. Made in the USA. Twenty year guarantee. Note: This case pack includes 2 of the Dura-Trel Camelot Planter Trellises, White, 80"H.